Ickle Bubba Stomp V3 Black Chassis All in One i-Size Travel System is a complete pushchair travel system package. It means you're ready to go and contains everything you need, including the Mercury i-Size car seat with Isofix base. You get up to a 4 year warranty (UK Mainland only) on this 'all you need for your baby' kit. Plus - it's ultra stylish and modern, and made to last. Click here for full Ickle Bubba warranty details. Ickle Bubba Stomp V3 Black Chassis All in One i-Size Pushchair Travel System is a complete pushchair travel system package. It means you're ready to go and contains everything you need too. You get a 4 year warranty on this 'all you need for your baby' kit. Plus - it's stylish and modern and made to last, as you would expect from Ickle Bubba. For your baby's comfort and your own ease of use, the seat can be used forward facing or parent facing. It reclines easily and the 5 point safety harness is straightforward to use. There is a Mercury i-Size car seat with Isofix base included in this package. This car seat is suitable from birth until your child is around 80 cm or 15 months old. Therefore, you can carry your baby from the car, in the car seat. Then, without disturbing your baby, you attach the car seat to the pram chassis and simply push your baby around. 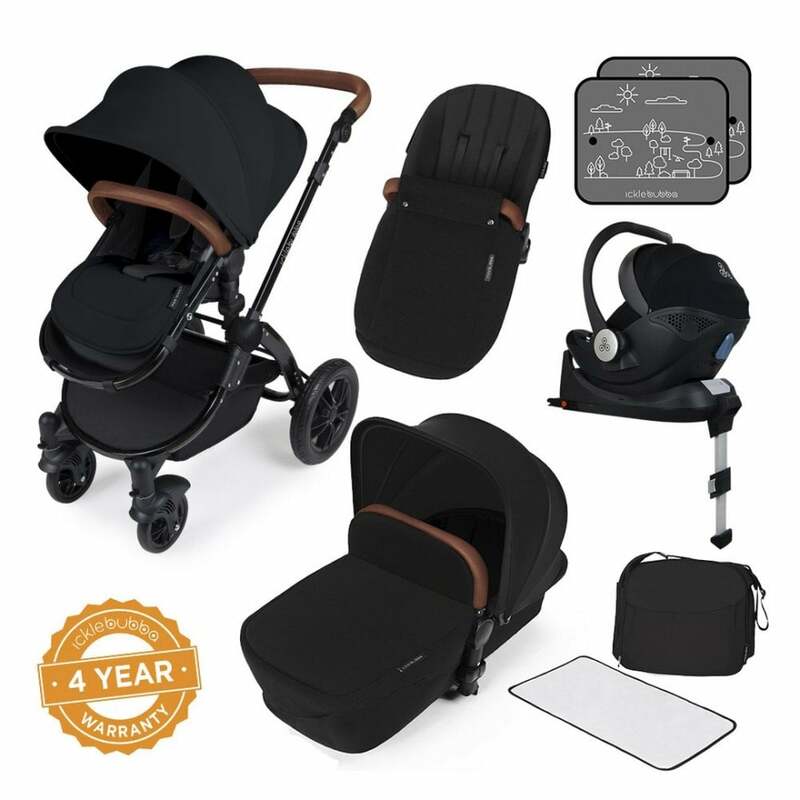 Stomp V3 Black All in One i-Size Pushchair Travel System was created to give you a pram to be proud of pushing... plus, it comes with a load of fabulous accessories too. Therefore, there's no need to go and buy extra bits and pieces with the Stomp V3 Black Chassis All in One i-Size Pushchair Travel System. Read on to have a look at our section on 'What's In The Box' below: there's everything you need apart from the kitchen sink! You also get a smoother ride thanks to the durable foam wheels. Plus, you wont get a puncture with these wheels, which saves you time and effort too. Importantly, Ickle Bubba have also included built-in, front and rear suspension on this model too, all good for for a bump free ride. Additionally, you can alter the height of the handle bar to suit your own preference. This is particularly good if you share pushchair pushing duties with another person but don't argue who's turn it is - share nicely! What Are The Specifications of Stomp V3 Black Chassis All in One i-Size Pushchair Travel System?